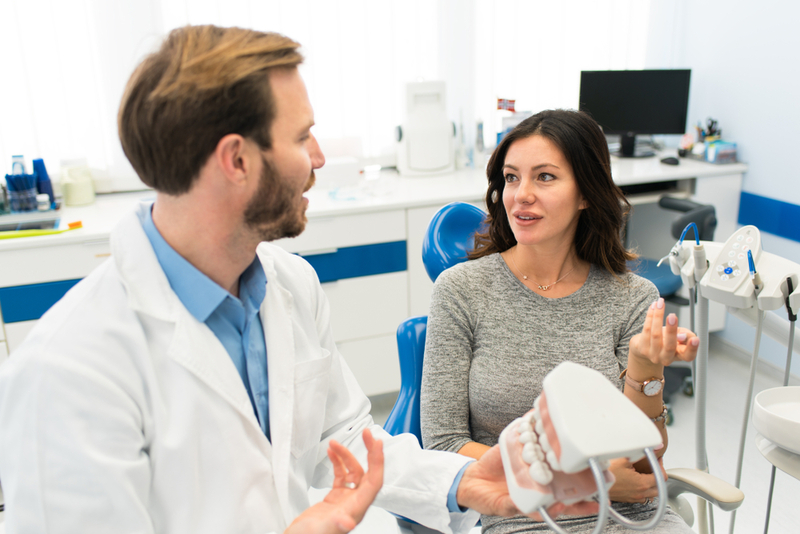 If you have significant oral health problems and are experiencing issues with the function and appearance of a large number of your teeth, your dentist may recommend you for something known as a full mouth reconstruction. A full mouth reconstruction is a term given to a combination of functional and cosmetic dental procedures that are used to restore your oral health and give you the appearance of a natural and attractive smile. Since no two patient’s smiles are the same, each full mouth reconstruction is tailored specifically to your individual requirements, thus enabling you to achieve the smile that you deserve. Your dentist will discuss which treatments may be most appropriate with you during your confidential consultation appointment. It is important to bear in mind that your full mouth reconstruction treatment plan may change depending on how well you respond to some treatments. For example, if you have root canal therapy but your tooth cannot be saved, your dentist may recommend replacing it with a dental implant. What are the benefits of choosing a full mouth reconstruction? There are a number of ways in which a full mouth reconstruction can benefit you and your oral health. For your smile to look great it needs to be healthy. Fortunately, many of the procedures used in a full mouth reconstruction target dental health. This includes drilling out areas of decay, removing plaque from the teeth and eradicating infected tissue that could compromise your oral wellbeing. By focusing on these problems, full mouth reconstruction could actually help to preserve many of your remaining natural teeth. This is especially true in the case of periodontal disease, which occurs when the plaque present on teeth irritates and eventually infects the gum tissue. Your jaw plays a vital role in maintaining your teeth and gums. When the jaw bone becomes compromised, the quality of your gums and tooth loss is a very real possibility. Patients who are given dental implants find that the process encourages further healthy bone growth, strengthening the jaw and giving them a more defined facial structure. Patients who may be suffering from problems with the temporomandibular joint, or TMJ, may see these resolved and their symptoms, which include headaches, jaw pain and stiffness and more also eased. By undergoing dental procedures that reduce the likelihood of periodontal disease from occurring such as those typically included in a full mouth reconstruction, you could also protect your overall health. When you look good, you feel good and the procedures included in this treatment program can help you achieve a smile that is natural yet beautiful. Modern dental restorations are created from the most esthetic materials possible, with treatments such as porcelain crowns, dental bonding and composite fillings all offering complete discretion while also returning the function of your teeth. No longer do you need to be concerned with the appearance of your teeth or obvious dental work. Instead patients can embrace a smile that looks healthy, attractive and real. The psychological benefits of a beautiful smile cannot be underestimated. Patients who have undergone a full mouth reconstruction report feeling happier and more confident in their appearance, and this in turn has benefitted their personal and professional relationships and enabled them to feel open to new opportunities. If you feel that you would benefit from a full mouth reconstruction program, or if you have further questions, please contact our offices today to schedule your confidential consultation.